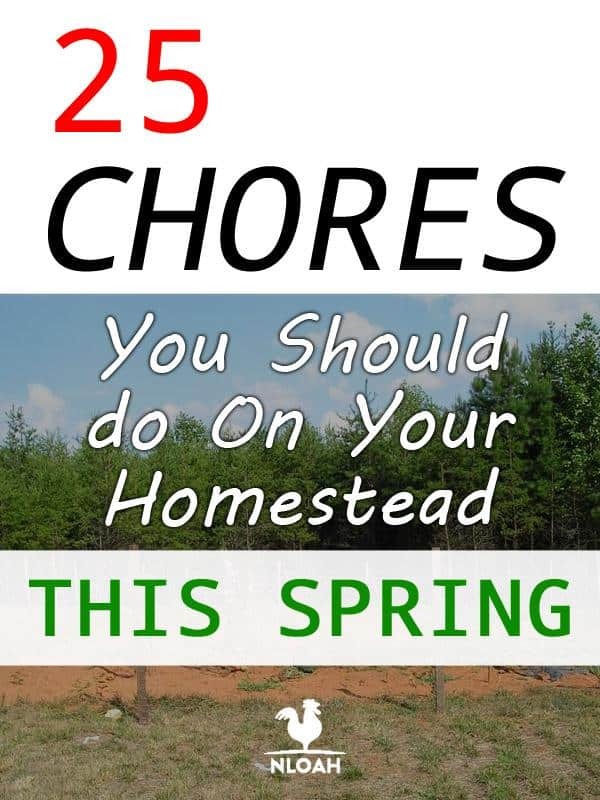 Your work is never done when it comes to the homestead. Spring is no exception. Organization is the most important aspect of being a successful homesteader, so make sure you have a running tally of everything that needs to be completed so you aren’t caught unprepared come May. These are a list of chores that you absolutely must complete before the temperatures begin to rise this summer. Make a map of where you plant to plant your new crops. Take the time to chart out your plans for the summer, and make a seed order list for your fall or winter crops. By staying on top of your summer to-do list before summer hits, you will be much more organized and much less stressed come June. If you don’t plan on buying all your seedlings or sowing directly into the ground, consider starting your own in the spring. Many plants, such as celery and artichokes, need to be started twelve weeks before you plan on putting them outside. As early as possible in the winter, you should make a list of all the plants you need to start indoors, and include a deadline of when they need to be started by. Where you live and your current climate will play a huge role in making this list. Whether your plan is to purchase chicks or to incubate them yourself, now is the time to start. A set of chicks takes three weeks to develop in an incubator, with most incubators holding up to forty-two eggs. Keep in mind that not all of these will come to fruition, so plan out how many chicks you plan to raise and plan on incubating batches accordingly. You can also hedge your bets on a hen becoming broody and incubating them for you, but this can be risky. If you plan on ordering day-old chicks, do so now, and expect their arrival in early May. The same logic follows for ducklings, keets, and other types of poultry you plan on raising. It’s not just a myth fabricated by Easter greeting cards–baby animals are usually born in the spring. Make sure your animals have nesting boxes and hay, and get supplies ready for birthing (such as clean towels, latex gloves, blankets, and the like). If you have goats, sheep, cows, or other animal that you use for dairy purposes, make sure you have ordered and cleaned your milking supplies. Get your stations ready, ensuring that all equipment is clean and in good condition. If you live in an area of extreme cold and snow, wait until the danger of any late snow storm has passed. Then, take down any materials you might have used to winterize your coop, pens, or hives. As the weather warms, you’ll notice that your pens, barns, and coops have begun to develop a funkier odor. Make sure you muck out all of your stalls and coops, and lay down fresh bedding. This is especially true if you are utilizing a deep litter method and haven’t replaced bedding all weekend. While you’re at it, be sure to get everything organized and in tip-top shape. Label containers of seeds, nails, bands, and anything else that tends to get lost in the shuffle. Spring cleaning isn’t just for inside your home–it’s also a great habit to get into outside as well. Tractors are a great way to provide your chickens or other poultry with the ability to rotationally graze. You’ll reduce the stress on your land and provide your birds with all the benefits of free ranging. Build these in the spring, so that they are ready to go as soon as your birds are out of the brooder. Heavy snowfall and lack of use in the wintertime tend to lead to a lot of breakage and damage. Spring is an excellent opportunity for you to mend any fences or pens before you have animals inside of them. Make any necessary repairs during the spring, including any new roofs, siding, or finishing. Make sure all of your equipment is in top working order. If you need to make repairs to an ATV, tiller, tractor, lawn mower, or other equipment, now is the time to do so. Order any replacement parts or machinery, and make sure all serviceable equipment is serviced (think oil changes and new spark plugs). If you’re thinking about adding a few new raised beds, do it now. The same goes for if you have damaged or disintegrating beds. Raised beds create extra space and can help you make the most out of limited or infertile land. In some warmer climates, it might be possible for you to grow vegetables throughout the winter months. Alternatively, if you live somewhere that’s a tad bit colder, you might be able to grow vegetables throughout the winter by utilizing a cold frame or greenhouse. In the spring, harvest crops such as carrots, greens, radishes, or beets. Whether you utilize a greenhouse or are planting directly into the ground, spring is the time to tidy up and prepare for new planting. Remove any old vines, decaying fruits, trellises, cages, or markers. Lay down black plastic or mulch in areas that need to warm up quickly, and prepare the soil for tilling by adding down a few layers of organic matter, such as compost. 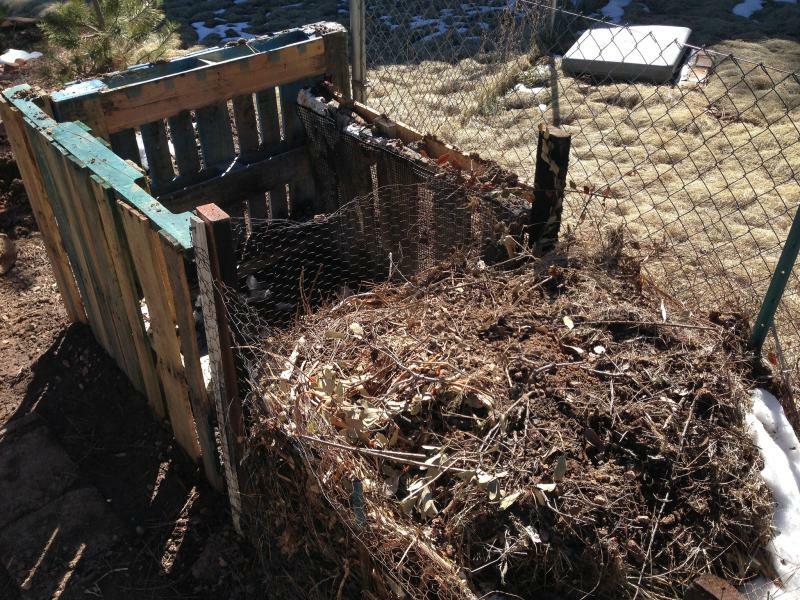 With planting season upon you, make sure your compost is ready to go. Turn the pile and add any leftover bedding or kitchen scraps. Separate out your piles if you plan to add more material. This will give your older pile the chance to finish “cooking” as the weather heats up. Whether you use a wood stove or another source of heat, now is the time to clean and ready it for next winter. Make sure you clean out any ash or other accumulated materials so that you eliminate any risk of fire. If you’re feeling extra motivated, you can also start cutting firewood to be used next winter. If you don’t already have automatic feed and water systems on the homestead, consider building them this spring. An easy livestock waterer can be made out of a fifty-five gallon barrel with a pipe fitting and a few drinking nozzles (make sure you get the type that fits the species of animal you will be watering). This will save you lots of time, muscle, and hassle in the summer from having to haul buckets of water back and forth. Similarly, feeders can be fashioned out of old five-gallon buckets, troughs, or barrels. Consider making a few of these this spring to ease your workload come June. Springtime is rainy, so it’s a good time to test out new rainwater systems. A smoothly functioning homestead will often have multiple water catchment systems around the house. These help conserve water for you to use in watering the garden or providing hydration to animals. A good spring cleaning should be performed on every aspect of the homestead, and your personal living space is no exception. Make sure you pay close attention to the kitchen, bathroom, and other high-traffic areas. Clean out and defrost your freezer, paying careful attention to expiration dates. Move any older items to the front so that you eat them first, and take inventory of what you have and what you need more of. Now is also a great time to organize your pantry, in addition to your freezer. Make sure you have tossed any old canned goods or other stored food in your pantry or closets. You have a large harvest coming up, so make sure you have plenty of room for fresh food. 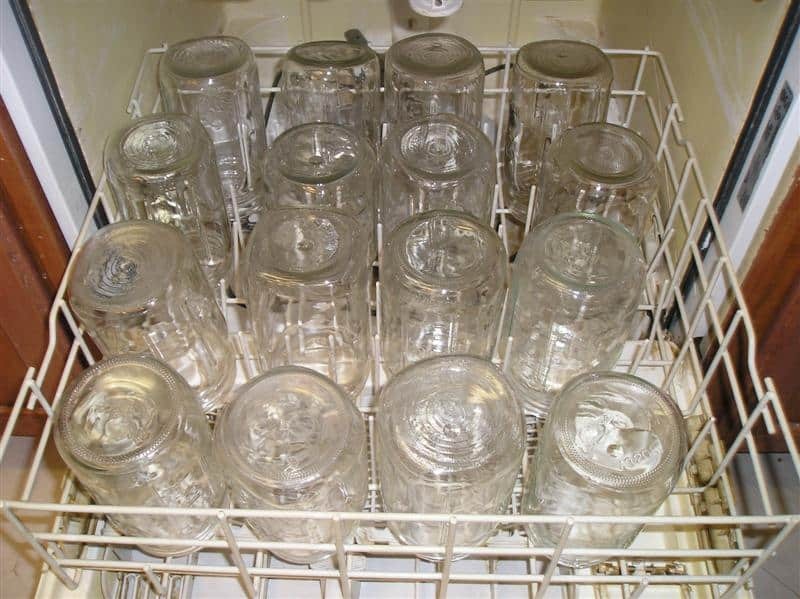 Make sure your canners are clean and in good working order. Canners, especially water bath canners, tend to get an unappealing film around the edges as the result of hard water buildup. Even if you’re diligent about cleaning them in the fall, they still tend to collect dust throughout the winter and could benefit from a nice scrubbing. Replace any equipment that is old or in disrepair, and start developing a stockpile of lids. Remember, bands can be reused from year to year, but lids cannot. Make sure your coop and run are in good working order. Check the walls and roof for damage, and repair or replace nest boxes. Clean out any cobwebs and repaint the outside of the coop, if needed. If you have any animal pens, this is a must-do item on your list. Make sure any latches are tightly secured, and replace any rusty or aged equipment. Fill in holes and repair any electric fence issues. 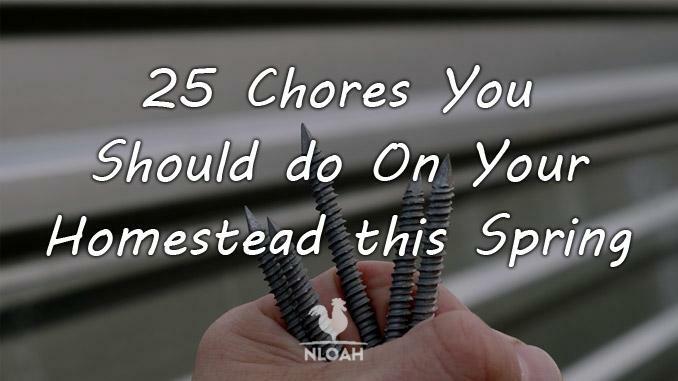 Again, you can’t neglect your own house when you’re thinking about spring homestead chores! Make sure your porch boards are securely nailed and not rotting. Clean gutters and downspouts, pressure wash your siding, and complete any other small repairs. Now is also the time to repair any equipment such as air conditioners, hot water tanks, appliances, and gas lines. If you have any low hanging branches or dead limbs, remove them. Prune your rose bushes and other perennials, and fertilize them if needed. Check all of your light fixtures, exterior and interior, for burned out bulbs, but pay special attention to solar equipment. Winter can take quite a toll on this equipment, so make sure it’s in good working order for the summer months. This should be one of the last tasks on your list, but towards the end of spring you will need to harden off any of the seeds you have started inside by putting them outdoors during the day and bringing them back in at night. After a few weeks of this, they are ready to be transplanted. 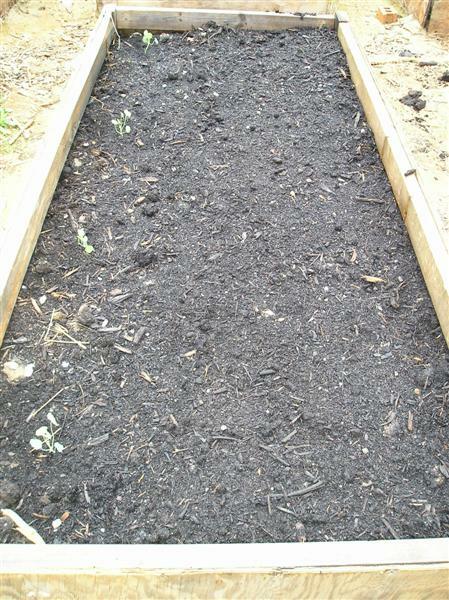 Once all danger of frost has passed, you can also direct sow any other seeds you plan to use. 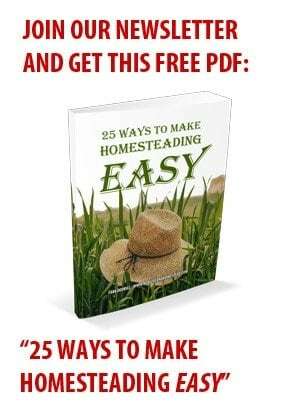 Don’t wait for summer to hit for you to get a handle on your homesteading tasks. Spring is a great time to knock a few easy-to-complete items of your to-do list. Happy homesteading!